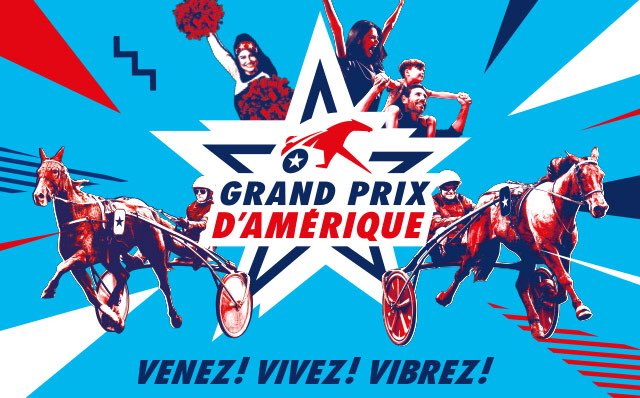 One race which is firmly on my bucket list before I leave Europe is this one, the Prix d'Amerique, the richest trotting race in the world. Held at Vincennes in Paris, it captures the imagination with huge local promotion. You're likely to see far more locals at this race than the Arc meeting. Harness and thoroughbred race wagering turnover in France is roughly split 50:50. In Britain, this race will be televised live on Racing UK. Analysing the form in intricate detail is global harness aficionado and racecalling prodigy, Luke Humphreys, @WorldRacingLuke. 2 Briac Dark (50/1): Fifth here 12 months ago and then second to Bold Eagle in the 4150m G1 Grand Prix de Paris. Had injury problems after that but qualified for this in the 2100m mobile trial race on New Year’s Eve, the Grand Prix de Bourgogne, behind Propulsion and Bold Eagle. Strong place chance but lacks the necessary class to win at this elite level but very consistent. He will need the perfect run here. Key player in the 4150m Grand Prix de Paris at the end of February. 3 Charly du Noyer (100/1): Was able to qualify when third in the G2 Grand Prix de Bretagne in November. Winner of a couple of classics as a 3YO and 4YO. Good third in 5YO G2 on Boxing Day behind Readly Express. One of the pace angles, but likely to be found wanting at the end. 4 Carat Williams (100/1): Has proven to be disappointing since his G2 win in November. Has notched up plenty of wins including the G1 French 5YO Championship and multiple G2 victories. Only seventh and fourth in the G2 Grand Prix du Bourbonnais and G2 Prix Ténor de Baune. Was in a striking position in the G2 Grand Prix de Belgique two weeks ago before galloping at the top of the straight. Overs considering how close he would’ve gone before galloping a fortnight ago. Each-Way. Probably lucky to have got into the field though. 5 Ringostarr Treb (33/1): Been very consistent over the years and deserves a go in this race. Third in the G2 Grand Prix du Bourbonnais on December 10 behind Bird Parker and Bold Eagle. Lucky G1 winner in August over Propulsion. Each-Way chance only. Key player in the Grand Prix de France over 2100m in two weeks if he runs in that. 6 Booster Winner (250/1): Ran seventh here 12 months ago, not in same form at all. Has done nothing in all four of the B Trials. 7 Valko Jenilat (60/1): Very consistent and tough. Won the G2 Grand Prix de Bretagne which capped off a very successful 2017. Can finish top five, just below the best. One that will enjoy the marathon G1 at the end of February. 8 Readly Express (2/1): Up there with the best horses in the world. Driver Björn Goop has won close to everything bar this race but gets his best chance yet arguably. Winner of 20 of 24 including the G1 European 4YO & 5YO Championship and the Swedish 3YO & 4YO Championships. Winner of the 5YO G2 trial race on Boxing Day and then ran a big third after coming from nowhere in the G2 Grand Prix de Belgique. You can either think he was disappointing or sensational in defeat two weeks ago, I think the latter. He gave them a big start and was closing on Bold Eagle and Bird Parker with every stride. Has been my tip since Boxing Day, he is the perfect racehorse, has sensational speed, the one to beat. 9 Bélina Josselyn (9/1): Last year’s second when nearly pinching it off Bold Eagle. Will need all the luck, like 12 months ago, to get near there. Has only been moderate in the trial races bar the G2 Grand Prix du Bourbonnais when storming home from nowhere for sixth, but Jean-Michel Bazire is a genius. 10 Propulsion (3/1): Super American-bred trained in Sweden that is the winner of more than half of his starts. Fourth 12 months ago when always caught wide and arguably covered more than ground than any other. Two times winner of the prestigious G1 Hugo Åbergs Memorial, last year in a European record of 1:08.1 for the kilometre rate and a time for the 1609m of 1:49.1!!! And did all the work! Was never ever going to be beaten in the 2100m trial race on New Year’s Eve once he found the front and was perfectly rated by Örjan Kihlström, who drove Maharajah to victory in 2014 in this. If he gets a similar run to that up front, he is unbeatable. That’s unlikely though, but is the second of the two principal runners from Sweden. 11 Timone Ek (250/1): Driven by Italian Enrico Bellei who drove him to victory in the feature open race in Italy in May, the G1 Gran Premio Della Lotteria, similar to the Elitloppet as its two heats then a consolation and final in one day. Connections have always thought very highly of him, but being targeted for the Grand Prix de France in two weeks. 12 Lionel (25/1): Disqualified at the start two years ago, then third 12 months ago. In the Bourbonnais he ran fairly finishing fifth, had no luck in the sprint trial but did nothing in the Belgique two weeks ago. Jury out. 13 Voltigeur de Myrt (250/1): Good old horse that was second four years ago. Fourth run in the race, hard to see him being competitive. 14 Wild Honey (250/1): One of the best mares in the world who was disqualified in this 12 months ago (for galloping - automatic DQ in Europe). Will be better suited in the Grand Prix de France in two weeks. Not outclassed but the trip etc isn’t her favourite. 15 Billie de Montfort (150/1): Has been racing at G1 level since the start of her career, not many fillies race in the Elitloppet Final and Prix d'Amérique in their lifetime, has been second and fourth in the two trial races she ran in. 150/1 overs as she is consistent. 16 Bird Parker (8/1): Winner of two of the four B trial races for this race and continues to surprise everyone. Last start win was when he had different shoes to normal too as he was shod! Has always been a trotter of exceptional ability but has gone up another level this Winter. Six months ago you would’ve said he’d be a very ordinary winner of the race, however he might be a genuine G1 trotter with the form he is in. Trainer Philippe Allaire could win ona pogo stick at present, trained the four Group race winners on the card two weeks ago, including this horse in the Belgique, and won the G1 Prix de Cornulier with Traders last week. 17 Oasis Bi (150/1): Third two years ago behind Bold Eagle and Timoko. Tenth last year. Now a 10yo, not going as good as he once did. Better suited in the Grand Prix de France and the Group 1 at Cagnes in March. Although he did finish third in New York in the G1 Yonkers International in October. 18 Bold Eagle (3/1): Best horse in the race, but that’s when he is at his best! Has won this race the last two years and also the Grand Prix de France twice and the Grand Prix de Paris, completing the treble last year. Went extraordinary in his Elitloppet Heat last year but obviously went over the top as he had nothing left in the Final when fourth. Despite being beaten in his last four runs, there is a fair chance he will still jump favourite with the PMU in France due to the French bias etc. However the fact of the matter is, he hasn’t been the same horse since the Elitloppet. He won two standard G1 races here and in Belgium. Then four seconds in a row, in four G2 races, that were G1 opposition due to three of those races being trial races for this and the European Championship in September, but was G2 to allow geldings from European countries, geldings can’t run in G1’s in France! Hasn’t looked the Bold Eagle of old in these last four runs, bar the run two back when he was never going to run down Propulsion. The sire, Ready Cash, failed in 2013 when going for the Prix d’Amerique hat-trick, due to a poor drive by Franck Nivard, who also drives this horse, when he took off way too early and was left a sitting duck. I don’t particularly like Franck Nivard as a driver, he drives some very good horses, but sometimes makes amateurish mistakes, like on this horse two years ago when he was going for the treble. One of my favourite horses, would love to see him do it, but question marks aplenty. Also suffered an injury before the first of the trial races in November.